Last week's accident involving a bus filled with students traveling to Humboldt State University really struck home for many of us in the higher education space. It hit even harder when we discovered that one of the victims was an EM pro in every sense of the word. Arthur Arzola was an advocate. He was compassionate. He was filled with a passion for the field. He wanted to see students succeed. 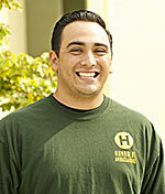 And, he put his everything into his role as an admissions representative at Humboldt State, reaching out to those students who had the potential, but needed the extra push. From all of the wonderful stories we've read about Arthur and from the testimonies of his co-workers and friends, we know he was the push those students needed. In fact, he was also the pull, going directly into their communities and bringing them right back to his campus. Arthur got what admissions is all about. He may have never participated in #EMchat--who knows, he may not have ever heard of us. But, he was one of us. And, we want to do something to honor him. A card and flowers seemed the likely route, but after mulling over some more ideas, Jennielle, Jillian, and I came up with something more fitting. A scholarship in Arthur's name, benefiting the students he sought to provide guidance to--first generation. We don't have any cool t-shirts this time, but you can be sure that we'll be donating the full amount of money raised to Humboldt State. If we raise a few hundred dollars, super. We'll provide a book scholarship. If we raise more, even better. We'll offset the cost of college, continuing Arthur's mission to open the door to dreams, potential, and success for hardworking, deserving students. We'll be running this fundraiser until May 16th and will keep you updated on our communication with Humboldt state regarding the initiative and our success along the way. Inside Higher Ed's Scott Jaschik had a much more eloquent post honoring Arthur earlier this week. Please share this campaign with your colleagues and your friends. The higher education community is a tight knit one. Let's come together for a phenomenal cause for a phenomenal man.